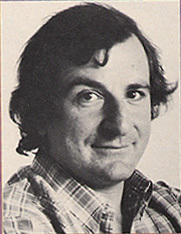 In 1988 I had the priveldge of interviewing Douglas Adams as he was promoting the book “Long Dark Tea-Time of the Soul”. 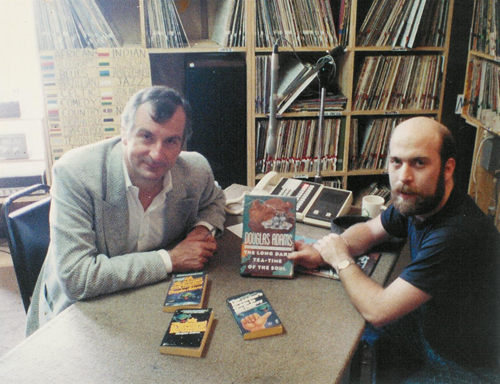 I recently discovered the only known cassette recording of that interview and I have successfully digitized and converted it to an MP3 file. Length of interview is 25 minutes and many topics are covered. I was pretty nervous when I did the Interview and had very little experience but I think it came out pretty well. “Save Target As”. The file is about 25 MB in size. I met Mr. Adams when “Mostly Harmless” came out. He did a book signing in North Dallas and I bought a copy, stood in line, and got him to autograph. I was so nervous that I could barely spit out a “thank you”. Jay, that is the coolest thing ever!! Just knowing Jay Lee the radio show host, the newspaper columnist and the famous folk musician is not enough? ……………………………………I had a feeling you were going to say that. Weeeeell, I guess it might be enough…maybe if I just tell everyone that I know Jay Lee the radio show host, the newspaper columnist and the famous folk musician *that can expel electricity from his fingertips*, that’ll be just as good. I am having problems searching you old entries. But I know you had a post with some rad quotes…my addled brain thinks they were Charelse Bukowski quotes and one was about fear or enemies…. ack.. I remember LOVING IT. Do you have a clue what I am refereing to? please help… thanks! Frikkin’ Awesome dude. I’m gonna tell all my friends about this. Thanks for sharing, Jay…excellent work! You are way, way cooler than me and your life is much more interesting. (But hey, we already knew that.) Cheers!